To answer this question, we should appeal to the BIBLE, GOD'S holy word. First, who are sinners? They are people who have sinned by coming short of the glory of GOD. 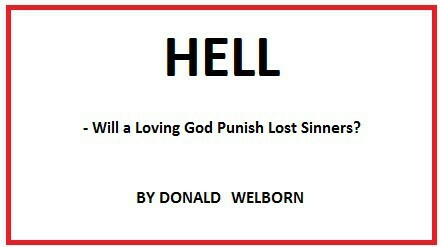 Sin is an English word that translates a word from the original language of the Bible, which means "missing the mark." In other words, all humans have missed the mark of PERFECT EXCELLENCE, or "the glory of God." Romans 3:23 states this truth. The reason we sin is because we are sinners. It is stated in Psalms 51:5 "Behold, I was shapen in iniquity and in sin did my mother conceive me." A rooster does not have to crow once or even twice to become a rooster. He crows because he is a rooster. We do not have to sin to become sinners. We sin because we are sinners. Jesus Christ, the Son of GOD, died on a tree with the sins of all mankind on Him. Peter, an apostle of the Lord, said "Who His ownself bore our sins in His own body on the tree" (I Peter 2:24). John the apostle said "He is the propitiation (or MERCY SEAT) for our sins; and not for ours only, but also for the sins of the whole world" (I John 2:2). Please notice that Paul the apostle said to both Jews and Gentiles, "Christ died for the ungodly" (ungodly meaning ALL who are not perfectly GOD-like) Romans 5:6. Can you now confess, in all truth and honesty, that you are a sinner and ungodly and need GOD's salvation? Jesus said in Luke 19:10 that He (the Son of man) "is come to seek and to save that which was lost." Being lost means we are separated from GOD. One day, a little boy was sobbing mournfully in a department store because he was separated from his mother. He was lost. Some clerks in the store came to his rescue and soon located his mother. She had been very distressed that the boy was lost. So much so was God grieved that He spared not HIS own Son to become a sacrifice for our sins (see Romans 8:32 "He that spared not His own Son, but delivered Him up for us all, how shall He not with Him also freely give us all things?"). GOD demands that sin be judged. Jesus, the Son of GOD was the only person who could qualify to be the sacrifice for the punishment of our sins. (Hebrews 2:9 "But we see Jesus, who was made a little lower than the angels for the suffering of death, crowned with glory and honor; that He, by the grace of GOD, should taste death for every man.") He "died for our sins according to the Scriptures; and that He was buried, and that He rose again the third day, according to the Scriptures" (I Corinthians 15:3-4). One question remains: How can I be saved from the wrath to come? (See I Thessalonians 1:10 "And to wait for the Son from heaven, whom He raised from the dead, even Jesus, which delivered us from the wrath to come" and Revelations 6:15-17 "And the kings of the earth, and the great men, the rich men, the chief captains, the mighty men, and every bondsman and every freeman hid themselves in the dens and in the rocks and mountains; and said to the mountains and rocks, "Fall on us and hide us from the face of Him that sitteth on the throne and from the wrath of the Lamb; for the great day of His wrath is come and who shall be able to stand?") Please carefully consider the four (4) things listed below!